S07xE01 – Season 7 begins with The Doctor, Amy and Rory being kidnapped and brought to a Dalek Asylum to stop the weird music and happenings that have been going on. At least that’s what I think they were brought there to do. It’s hard to tell sometimes with Moffatt episodes. Either that or I’m just dumb, which is a good chance. 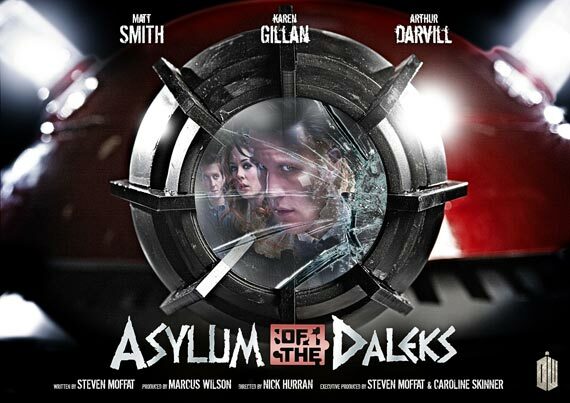 Anyway the Daleks are afraid to go down to the asylum themselves so they enlist The Doctor to go down for them, and they decide The Doctor needs his companions to join him. Yay for Rory and Amy being roped into the madness. Best of the episode: Oswin Oswald hands down was the best part of the episode, because she was a surprise! Who is Oswin Oswald? The Doctor’s new companion later in the season, after we are forced to say goodbye to the Ponds *sob*. Why was it a surprise? Because we were told she would be joining the show in the episodes to air next year. No one expected to see her in the Season Premiere. In this episode Oswin is a damsel in distress, but with chops basically. Her ship has crashed on the Dalek Asylum which happens to be an entire planet full of Daleks. She is trapped in her ship, but able to hack into the Dalek technology and converse with The Doctor (The Chin) and Rory (The Nose) all while baking souffles, where did she get the milk? Worst of the episode: Rory and Amy’s marriage on the verge of divorce. I’m really not sure how to feel about how this went. Amy apparently decided to become a model. We know this because the first time we see it is in Closing Time from Season 6 where The Doctor sees her giving her autograph to a little girl, and seeing a giant poster of Amy in a department store. So back to this episode, you find Amy at a photo shoot where Rory is waiting in her dressing room. He’s there to have her sign the divorce papers and then “like magic” they aren’t married anymore. This is where every Whovian screams at the same time “what the hell? No!” Well I know I did. And this leads you to immediately think the fame has gone to her head and she is too good for Rory now. Luckily this wasn’t the case. We later find out that she chose to leave Rory because she can’t have children and Rory wants kids (uh, did they forget they have a daughter?). Rory reassures her that he loves her for her and would never regret his choice to be with her (awww). Where did this episode leave us? : We were left with The Doctor blowing up a chunk of Daleks, Amy and Rory getting back together, discovering a new creepier Dalek (dead humans with the Dalek eye protruding from their forehead. ew! ), and oh that’s right, Oswin is a Dalek too! Which leads us to think that The Doctor is going to somehow save Oswin at some point either before she crashes onto the Asylum, or directly after. This we will have to wait until I believe the Christmas episode to know how it plays out. Gah. The episode wraps up with Oswin deleting The Doctor from every Dalek’s memory, which sparks a big chorus of “Doctor Who?” from all the Daleks, and then it was time for The Doctor to take Amy and Rory back home. Final shot? The Doctor himself singing “Doctor Who?” while dancing around the TARDIS. Adorable.